Fill a large Dutch oven or pot halfway with oil. Attach a deep-fat fry thermometer on the side. Heat over medium to 350 degrees F.
Meanwhile, mix together the chicken, Italian seasoning, egg, 1/4 cup panko, 1 teaspoon salt and a few grinds of pepper in a large bowl. Scoop out 2 heaping tablespoons of the chicken mixture and flatten into a 2-inch circle in your hand. Put a mozzarella cube in the center of the circle. Pat the meat mixture around the cheese to encase it in a ball. 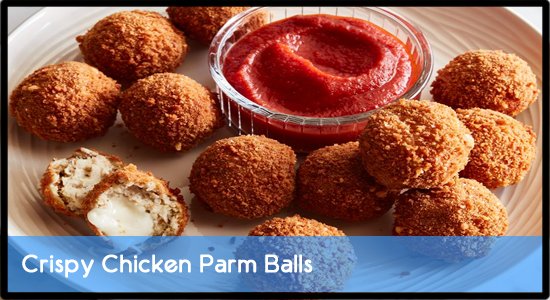 Set the ball aside on a plate or baking sheet and repeat with the remaining mozzarella and chicken mixture. Stir together the Parmesan, remaining 1 cup panko and 1 teaspoon salt in a medium bowl. Working one at a time, toss the chicken balls in the panko mixture until they are completely coated, pressings the panko into the ball with your hands to make sure it sticks. Fry the balls in batches until deep golden brown and the chicken is cooked through, 6 to 8 minutes. Serve with the marinara for dipping.